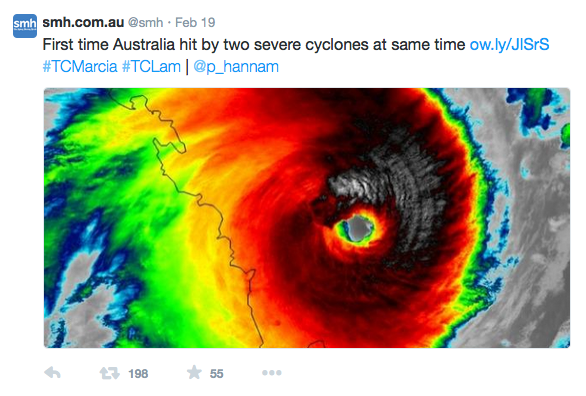 It’s not every day that a Category 5 cyclone hits Australia. It’s certainly even more unusual that two cyclones hit Australia on the same day, but that’s exactly what happened during my first week back in Queensland. Wow, I timed that well, didn't I? Cyclone Lam didn’t cause Brisbane much trouble. While it was a Category 4 cyclone, and was very destructive in some areas of the Northern Territory, its effects were not felt in South East Queensland. Cyclone Marcia had been downgraded to a Category 1 storm by the time she reached Brisbane, but the weather surrounding the system, hung around for days. That's several consecutive days of heavy tropical rain. Around the same time, an alarming picture of the storm approaching Brisbane Airport appeared on Twitter. Brisbane Airport's Twitter feed later corrected the news channels with a tweet stating the photo was from a different storm event. Aussie larrakins love a good hoax even, it seems, in the face of a crisis. Television coverage and images shared on social media during and after the cyclone showed scenes of widespread devastation, including massive trees down, roofs ripped off houses, coastal erosion leaving great cliffs in beaches and floodwater absolutely everywhere. 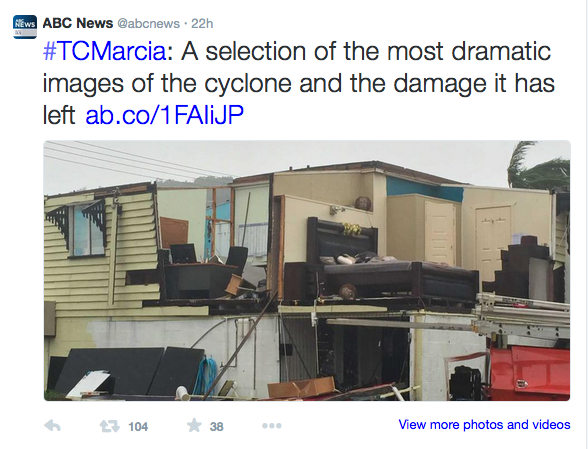 How did Cyclone Marcia affect Brisbane? On February 20, it rained all day across Brisbane. The following day as Marcia, by then a Category 1 system, passed steadily over the Sunshine Coast, Brisbane and the Gold Coast the Sunshine State’s normally bright days were replaced by dark skies. Heavy rain pelted the city relentlessly. Having experienced hurricanes in the Caribbean, I knew all too well the intense fury heavy weather systems could unleash. 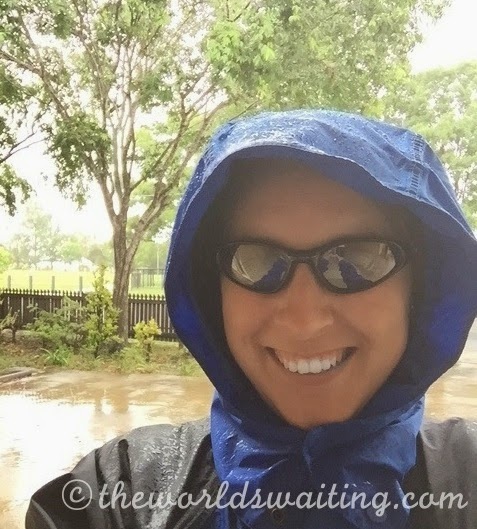 I kept an interested eye on the news, but fortunately the endless rain was my only experience of Cyclone Marcia. My street is on a slight incline and water gushed along the edge of the road continuously for three days, but it wasn’t especially windy in my neighbourhood. As long as you didn’t mind getting drenched, it was quite possible to walk to the shops. I first lived in Queensland in 2011 and remember seeing some of the impact of Cyclone Yasi. I also visited Bundaberg in early 2013 and saw the devastation that followed the flooding there. I feel for those that now have a clear-up operation ahead of them, not just up north, but around the flooded low-lying areas of South East Queensland too. Given how little impact the cyclone had on me, and my home, I feel very lucky. Here’s hoping for a quieter week, next week!